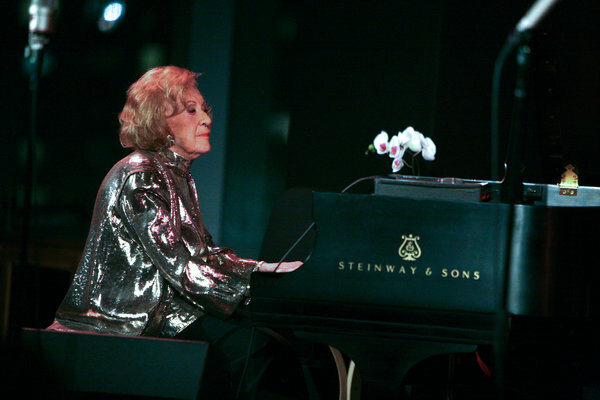 Marian McPartland, the genteel Englishwoman who became a fixture of the American jazz scene as a pianist and, later in life, hosted the internationally syndicated and immensely popular public radio show “Marian McPartland’s Piano Jazz,” died on Tuesday at her home in Port Washington, N.Y. She was 95. By 1958, she was well enough known to be included in Art Kane’s famous Esquire magazine group photograph of jazz musicians, the subject of Jean Bach’s acclaimed 1994 documentary, “A Great Day in Harlem.” One of the few women in the picture, she stood next to her friend and fellow pianist Mary Lou Williams. Ms. McPartland’s contributions to jazz were not limited to her piano playing. An enthusiastic and articulate spokeswoman for the music, she lectured at schools and colleges and wrote for Down Beat, Melody Maker and other publications. (A collection of her essays, “All in Good Time,” was published in 1987 and reissued in 2003.) Most notably, for more than 30 years her “Piano Jazz” was one of the most popular jazz shows ever heard on the radio. The show, produced by South Carolina Public Radio (now ETV Radio), made its debut on NPR in 1978. The format was simple: an informal interview interspersed with extemporaneous duets. While on a U.S.O. tour in 1944 she met the American jazz cornetist Jimmy McPartland in Belgium; they married in early 1946, and she moved with him to Chicago later that year. Her survivors include two grandchildren. That album provided a rare showcase for an underappreciated aspect of her talent: although she told The New York Times in 1998 that she “never had all that much faith in myself as a composer,” she was a prolific songwriter whose work was recorded by Peggy Lee, Tony Bennett, Sarah Vaughan and others. She performed her symphonic work “A Portrait of Rachel Carson” with the University of South Carolina Symphony Orchestra in 2007. In her last years, Ms. McPartland received numerous honors. She was named a National Endowment for the Arts Jazz Master in 2000, given a lifetime achievement Grammy Award in 2004, inducted into the National Radio Hall of Fame in 2007 and named a member of the Order of the British Empire in 2010.